There is a very simple reason why you're not seeing a glamorous photo (it's all relative, really) of me wearing this fabulous sweater right now. But I don't want to tell you what that reason is. Because I can't quite believe it. And the reason is not because I haven't quite finished it. First of all, I have to tell you that I really enjoyed knitting it. The pattern is the Hourglass Sweater from Joelle's book, and it's knit in the round. 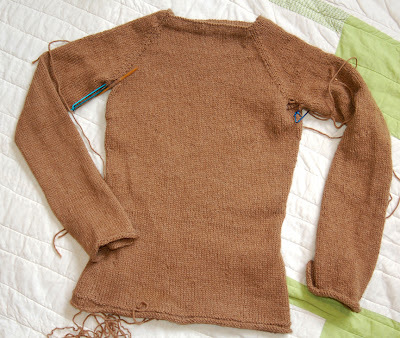 Once you've knitted the torso and the sleeves you join them together to finish the yoke, and it's a pleasure to watch the sweater literally come together on your needles. Plus, I can't think of a more relaxing project to knit: you just go around and around and around until it's time for an increase or decrease, which couldn't be easier to do. And I love the yarn. It's a 100% alpaca that I purchased quite a few years ago, started another sweater that fell by the wayside, and began this sweater last winter instead. If I were to start all over buying yarn I would probably choose something with a little more color, but as far as fibers go, I really like the alpaca. Yes, it took me a year (or so) to finish this sweater. But no mind. It was fun! 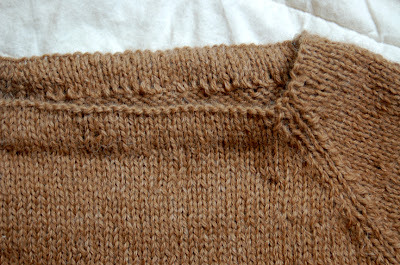 I didn't even mind sewing down the live stitches at the neckline, which was easier than I led myself to believe. Don't you just love it when you psych yourself out about a task and then discover, when you finally sit down to accomplish it, that it was waaaaaay easier than you imagined? Well, it's a good thing I enjoyed making this sweater so much, because I'll be making it again. No, I don't mean that I'm going to rush out and buy more yarn to start another sweater just like this one. I mean I'll be making this sweater again. Because the sweater I just finished is too tight! I can hardly believe it, and I can't bring myself to rip it apart just yet. But I will, and I'll make it again in the next size up, and this time it will fit. And I'll enjoy knitting it. I'll enjoy every single stitch. I think if I didn't have a friend or loved one that it fit, I'd make it my mission to hunt a new one down, become best best friends forever and seal the deal with that gorgeous sweater. Ah, the agony of illfit. I'm guessing the yarn must be $$$$. I've never cared to learn to knit, but your sweater makes it seem a lot more appealing. But then I remember Florida weather doesn't really allow for much sweater wearing--oh well. Good luck on the next one!! Looks great!! I would buy that book JUST for that pattern!!!! It's too bad, what a beautiful sweater! But you have a good attitude about it! did you wash and block it yet? b/c alpaca relaxes and stretches out a lot and tends to not bounce back. ask me how i know. How you inspire! I'm knitting the very same sweater from yarn spun from my parent's neighbor's sheep that I recently dyed. I'm about 12 inches into the body and am quickly realizing that it's likely going to be too snug. I've been paralyzed by the thought of starting again, but now I'm convinced that this is the right thing to do. Thank you, thank you! oooh thats brutal!! it looks great though...is there anyway you can block it out to your size? AD: you can borrow my copy of the book any time you like--I love almost every pattern in it! Bradyphrenia: really, should I wash it and block it to see what happens? I'm never sure whether that will alter the yarn if I need to rip and start over. But I would be soooo happy if it worked and ended up fitting! Jenni: I wish it was just a matter of losing 5 lbs. It's tight all over, and I don't carry much extra weight (on my top half, anyway). Argh! i love that neckline. and the colour you chose. and washing it? what's the worst that could happen...? oh wait, lots of stuff. I really like the style of the sweater, especially the neckline. It's a shame a knitted object requires major reconstruction to resize. Make me love seams even more. Seams with extra fabric. I think you're not modeling the sweater because you're PREGNANT! I would soak it in wool wash like Eucalan for an hour or so and then lay it out on a towel, roll it up in the towel and then shape in on a fresh one. You'd be amazed at the inches you can find hidden in there! Also, a few inches of negative ease never hurt anyone. I *always* make my top-down raglans a few inches smaller than my bust. If not, they get all droopy a couple of wearings in. Much luck to you!!! hiya, i have that book too and contemplated the jumper, but haven't knit anything complicated in about 10 years! for how much ease did you allow? i noticed the size is given as finished size, rather than fitting a certain body size, i'm not sure which one to go for at all. also, i would definetely have to mix and match the sizes, do you know of any link that explains which of the sizes/rounds/stitches in the instructions refer to which of the three finished measurements: bust, length and sleeve length? ohhh... ouch. but i'm wondering the same as the other comments... have you blocked yet? alpaca can grow like crazy... fingers crossed for you to not have to re-knit! How tight is too tight? I'm with the majority here -- block and see what happens. I've made two things from this very same book, which I found "accidentally" (see my blog for the whole long story) and love both of them. I looked at the hourglass sweater and considered making it. Did you use the yarn they specify?